I am really hoping you can help me, and so is my four year old daughter. 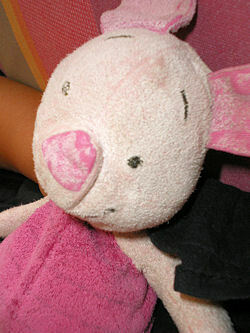 In 2004 my sister bought a Piglet (as in Winnie the Pooh) soft toy from Marks and Spencer in the UK for my daughter. He is a bit worn in this photo-his colours were obviously a lot brighter, and he had black stripes across his tummy. He was about 10 cm tall Sorry, my goof – about 4″. Piglet quickly became a very well loved special toy, the one she slept with and carried everywhere with her. Unfortunately he was recently lost. Sleepless nights have followed as my daughter is devastated. The obvious question is where on earth can I find a replacement? Is there any way of tracking one down? I would be eternally grateful if you could please help us to find a new Piglet. search for plush piglet…they have lots to choose from! ebay has many as well. Looks like an Gund Piglet. Come in many sizes. Here is one around 5″ tall. We had a small Piglet in stock, but the Mark and Spencer part of her description is evidently important. Hopefully she will read this post and clear this point up for us. Thanks Tami!! Thanks everyone for your help but yes, the Marks and Spencer brand is crucial. There are a lot of Piglets out they all look a little different!